Reference number for this case: 4-Oct-54-Chamonix. Thank you for including this reference number in any correspondence with me regarding this case. Chamonix, October 4. -- Very numerous people, among whom were the officers of the school of high mountain, the gendarmes of Chamonix and the pilot Guiron, specialist in the flights in high mountain, who flew over the regiment at this time, stated to have seen during more than one hour, a shining apparatus evolving between the Mount Blanc and the Mount Lachat. Pilot Guiron indicated that flying at approximately 2000 meters above Favergas, he saw a machine which, he said, did not have any resemblance to a normal plane. Moreover, the direction followed at high speed by this apparatus excluded the assumption of a weather balloon. Saint-Brieuc, Oct. 4. -- Several people claimed to have seen, at 300 or 400 meters of them, towards 08:45 p.m., a "flying cigar", at an altitude of 50 meters approximately. The machine, they stated, could be 15 meters in length and lit by intermittencies of pink gleams. It moved without noise. These statements were confirmed by a motorist from Tourcoing passing in Comines. A large number of people, among whom were the officers of the school of high mountain, the gendarmes of Chamonix and the pilot Guiron, specialist in flying above high mountains, which flew over the area at this time there, stated to have seen a shiny machine evolving between mount Lachat and Mount Blanc. The pilot Guiron indicated that flying at approximately 2000 meters above Faverges, he saw a machine which did not have any resemblance to a normal plane. Moreover, the direction followed at high speed by this apparatus excluded the assumption of a weather balloon. Many people, among whom an airplane pilot, observed the flight, above the solid mass of the Mount Blanc, of a strange apparatus that they state not to have any resemblance to a plane. [captioned photograph:] Grouped close to the gendarmerie, the children of the school of Chamonix saw, too, the mysterious object. For the kids, it is "the balloon in the sky." Quite simply. The gendarmes, skeptics, declare: "Since then they see some everyday." A hot Sunday sun sets ablaze the valley of Chamonix. Walking quietly in the streets or chattering on their doorsteps, the residents already make projects for the 1955 season. Instantaneously, hundreds of heads rise towards the sky in this direction. A round, luminous, silent object moves slowly in direction of mount Lachat. - It is a flying saucer, some state, not very reassured in the moment. - It is a weather-balloon, answer others, skeptics. Immediately, the population divides into two. Already, one directs binoculars on the snow-covered summits. Already, glasses, optical devices and telescopes scan the sky relentlessly. Charmed at this unexpected spectacle, a compact crowd soon floods the streets. The gendarmerie tries to calm the minds down while stating that it is simply a weather-balloon. But the gendarmes cannot know that the alleged weather-balloon moves against the wind! - See, there is blue, white and red. Somebody sees the machine as large as one's thumb. Another describes it like as a small coin. - It's one of them... It is a saucer indeed! Nobody will be able to calm down Mrs. Pedrotti! In the bottom of Chamonix, sitting on a chair, his telescope perched on a table, Mr. Carrier, hotel owner, scoffs. - It is merely a child's balloon, he says laughing. The officers of the alpine military from the high mountain school also observe, but with calm, the phenomenon. For them this is by no means a weather-balloon but, putting aside the notion of the "saucers" - as too whimsical - they elect an astral display. During four hours, the "round, luminous and silent object" will continue to drift slowly in the sky to finally disappear behind the pass of the Bonhomme. In the course of the same afternoon, at a few kilometers from Chamonix, a pilot flying at 2000 meters of altitude sees from his cabin a luminous, round and flat object, slipping by at a vertiginous speed. - By the time I directed my apparatus, the "thing" had already disappeared. The "thing", as the aviator calls it, had neither wings, neither tail, neither rudders, nor wheels: it was round and flat like... a saucer. To these phenomena of the sky which, for a few weeks, have multiplied at an accelerated rate, the scientific world opposes a circumspect silence. 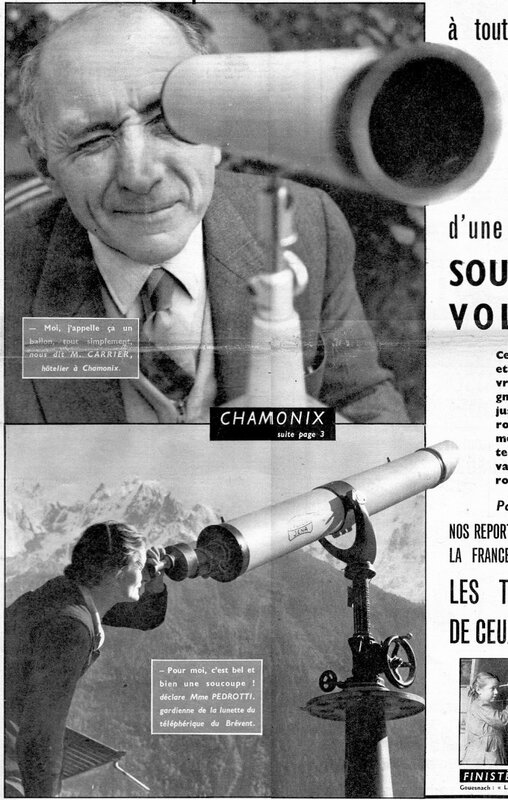 According to the astronomers, the event of Chamonix was merely an appearance of the planet Venus, visible in daylight, in clear weather, in the high mountain. The pilot on the other hand, had seen, according to them, only a mere meteor. [Captioned photograph:] Mr. Chol: "Using binoculars, I distinguished the object well. It had the shape of a bean, colored in red, blue and white..."
[Captioned photograph:] GUIRON. - Airplane pilot, he did not believe in the saucers. Now, well, you know, he starts to wonder about this. The two authors note that on October 5, 1954 at an unspecified time in Chamonix in the department of Haute Savoie, a pilot observed a cigar and saucers. "Many people, among whom an aiplane pilot, observed the flight, above the solid mass of the Mount Blanc, of a strange apparatus that they said had no resemblance to a plane." The authors indicate that on October 2, 1954, a mysterious shining machine was reported by hundreds of witnesses in Chamonix, floating in the sky during one hour. Luc Chastan indicates in his database that in the Haute Savoie in Chamonix on October 2, 1954 at 17:12 hours "Very numerous people, among them the officers of the school of high mountain, and the gendarmes of Chamonix, stated to have seen a shining machine move between mount Lachat and Mount Blanc." The source is indicated as "UFOs at Close Sight by Gross Patrick ** http://ufologie.net" and "Ovni, Premier dossier complet... by Figuet M./ Ruchon J.L. ** Alain Lefeuvre pub. 1979". The website indicates that on 2 October 1954 at 20:00 in Chamonix, France, "An unidentified object was sighted, but with appearance and behavior that most likely would have a conventional explanation. One object was observed at a mountain." The sources are indicated as: Vallee, Jacques, Computerized Catalog (N = 3073); Hatch, Larry, *U* computer database, Author, Redwood City, 2002. 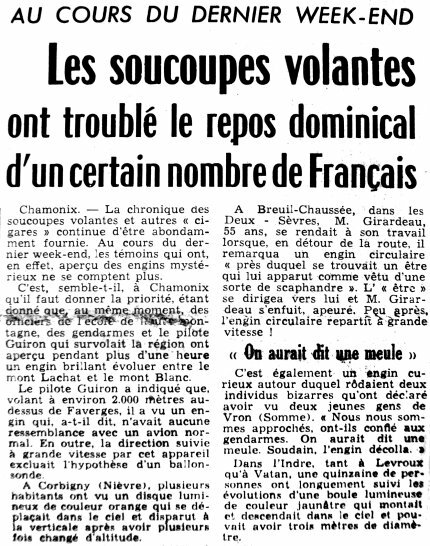 [vm1] Article in the regional newspaper Var-Matin République, Toulon, France, October 5, 1954. [qh1] Article in the regional newspaper Le Quotidien de Haute-Loire, France, October 6, 1954. [tl1] Article in the regional newspaper Le Tarn Libre, Albi, Tarn, France, page 1, 15 octobre 1954. [ra1] Article in the French magazine Radar, Paris, France, October 17, 1954. [um1] "dans le Tarn> La grande vague de l’automne 1954", article in the UFOmania ufology magazine, Didier Gomez publisher, France, #41, page 10, Fall 2004. 1.1 Patrick Gross February 27, 2010 Addition [lc1]. 1.3 Patrick Gross July 29, 2010 Addition [le1]. 1.4 Patrick Gross October 19, 2011 Addition [bg1]. 1.5 Patrick Gross October 13, 2016 Additions [um1], [ub1].